While on a business trip to south Florida in November 2007, I captured this sunrise. I was up and at the beach very early in the morning and this was my second or third morning at the beach. I put my 'mini' table top tripod in the sand and composed the image. 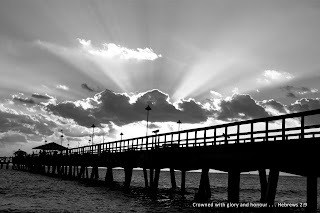 It wasn't until I was processing the image and I stood back from the monitor that I realized there is a crown with rays coming out of the clouds. Have fun shooting! Capture the beauty of God's creation.